Harper Timber carry a massive range of treated timber products to protect against Termite attack & Decay. 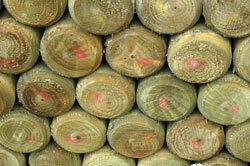 On site is a range of structural, landscape & fencing grade Treated Pine. Harper Timber can supply treated hardwood in a number of hazard levels. The treatments used to protect pine vary depending on where and how the timber will be used. The most common outdoor treatments are Copper Chrome Arsenate (CCA), Alkaline Copper Quaternary (ACQ) and Light Organic Solvent Preservative (LOSP). A different strength LOSP is also used for internal applications (house framing) along with H2F treatments such as bifenthrin. End-tags/burn brands/ink stamps indicate what treatment has been used and the hazard level to which the timber has been treated. CCA treated timber is suitable for all applications except domestic decking boards, handrails, children's playground equipment, picnic tables and external seating. All treated timber manufactured by reputable companies and handled correctly is safe. CCA treated timber has been used world-wide for more than 70 years without evidence of harm to human or environmental health. After a 2 year review the government regulatory body APVMA found "there was no compelling evidence from the available data to conclude that there was likely to be an unacceptable risk to public health from exposure to arsenic from CCA-treated timber"
That there was no recommendation to remove existing CCA treated structures illustrates it is not seen as dangerous. CCA continues to be approved for the majority of outdoor uses i.e. deck structures, pergolas, fencing, landscaping, vege gardens. However they did take a precautionary approach and restricted CCA treated timber being used in certain applications. H2 LOSP treated timber has been used in Australia since the 1990's to protect house framing from termites. In 2004 pine manufacturers launched a new type of treatment - blue pine framing or H2-F. Treated to and H2F level is suitable for internal framing applications. Can't be used in external applications. It has been dyed blue to make it easy to distinguish from untreated framing. H2-F is suitable for use south of the Tropic of Capricorn.